It's the Good News Parcel Company with a very special delivery! Join Colin Buchanan and his mate Nudge as together they sing, smash stuff, and rip the wrapping off the most wonderful news of all - Jesus! Blast off with 10, 9, 8...God is Great, find out Ze Baddest Sickness in Ze World, hear the Global WarNing, take off with the Super Saviour, and meet the crew of Are You Serving Cap'n Jesus?! Come and hear God's Good News, wrapped up in over an hour of music and mayhem that will have you singing, dancing, and laughing along. Special features include Behind the Scenes, Bloopers, and a bonus song, Remember the Lord. 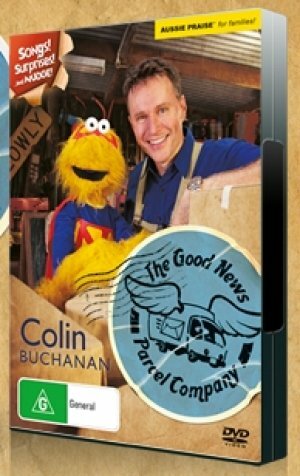 The Good News Parcel Company by Colin Buchanan was published by Authentic in May 2009 and is our 15255th best seller. The ISBN for The Good News Parcel Company is 705105226491. Be the first to review The Good News Parcel Company! Got a question? No problem! Just click here to ask us about The Good News Parcel Company.